By definition, walls are barriers. They can also act as windows to the conflicts engulfing their surroundings. In times of strife walls offer a means of communication and self-expression for members of all social and religious communities. They have proven themselves an effective tool in establishing dialogue between suppressed voices and opinions by offering a canvas or soapbox for the oppressed. The Berlin Wall and The Peace Lines Walls of Northern Ireland are but just two examples. They are storytellers - absorbing and reflecting their surroundings - and becoming silent witnesses to our lives and battles. 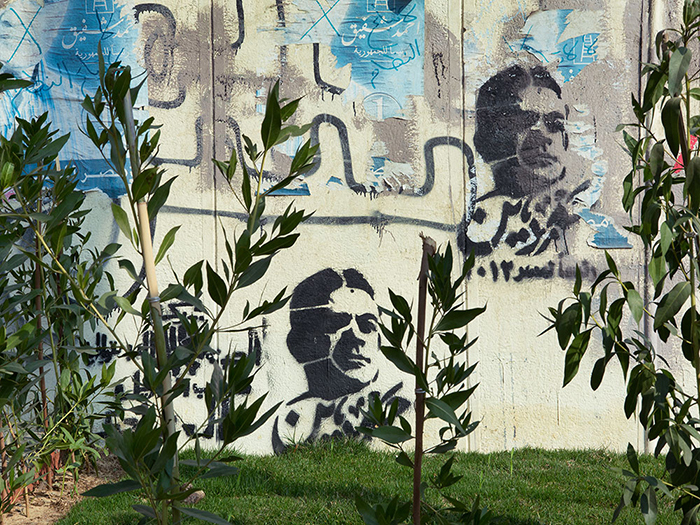 Breathing Walls is a project I originally started photographing in Lebanon, my country of origin. I felt the necessity to document these ephemeral testimonies of life as a record of an important period in time. With the rising of the Arab spring I decided to broaden my project and begin documenting other countries in the region where the walls are a crucial tool of communication and an unbiased reflection of the socio – political status. Egypt being the most recent series, I intend to continue to photograph this country and others in the region in order to archive the constantly evolving urban landscape. Rhea Karam lives and works on New York, NY and Beirut, Lebanon. To view more of Rhea's work, please visit her website. You can purchase New Seeds, Egypt from Fraction Editions.